The Muscular Dystrophy Campaign has funded more than 500 wheelchairs for children over the past year and is concerned that the NHS will refuse to cover the cost of maintaining these chairs, leaving patients and their families saddled with a great expense. If a wheelchair needs repairing, users are often told that there is a lengthy wait for the repairs, even if it is an NHS chair. Wheelchair maintenance should be treated as a matter of urgency, especially where the individual is reliant upon the equipment for health reasons as well as quality of life and independence. It is quite obvious that the Gloucestershire PCT is not really interested in saving money or listening to reports if it involves them having to re-write any policies or agreements, unlike the Lincolnshire PCT which is actually piloting personal budgets for wheelchairs. I hope the South West wheelchair pilot forces PCT’s into providing a better service, if not things will probably just get worse for wheelchair users as demand increases. 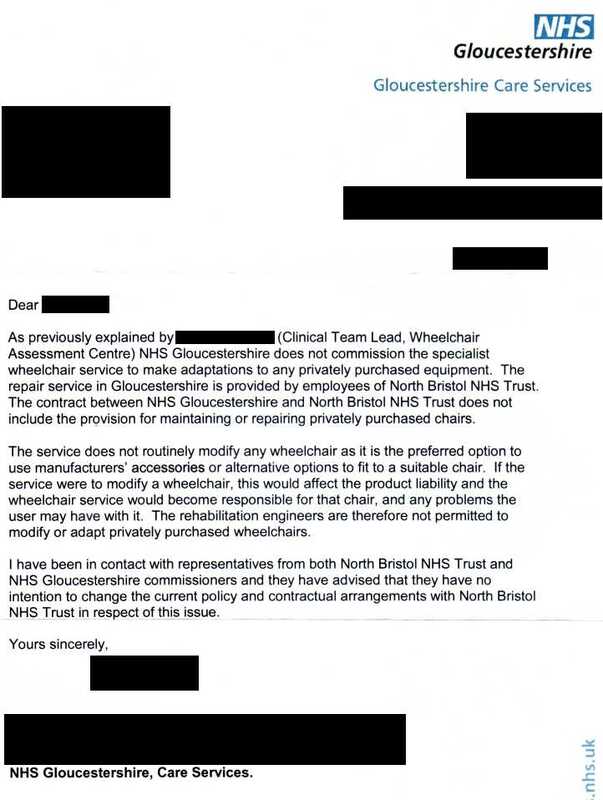 The letter also says that wheelchair services do not like modifying wheelchairs, this is ludicrous, most people with a complex disability need modifications to fit their needs, wheelchair manufacturers are guided by the most common needs and cannot provide for the more complex needs of someone with Duchenne Muscular Dystrophy for example, it is just not cost effective for a business. The NHS is supposed to be patient centric, treat each patient as an individual and provide for the specific needs of each patient, from what I can see wheelchair services doesn’t see itself as part of the NHS but more a private entity working to it’s own rules. I’m sure wheelchair services are one of the few departments who would welcome Andrew Lansley’s move towards privatisation of the NHS, 57% of their budget already goes to back-office costs, no doubt they would like to increase this number so management gets even more money which should be spent on patients. I will pursue this further as they give no good reasons in my opinion, change is needed but they seem unaware of this, or maybe they are just unwilling. This entry was posted in Health and tagged Duchenne Muscular Dystrophy, electric wheelchair, letter from NHS, NHS, NHS South West Wheelchair pilot, no adaptations to private wheelchairs, WCS, Wheelchair Services. Bookmark the permalink.